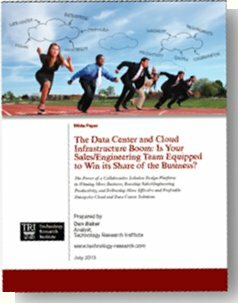 The Data Center & Cloud Infrastructure Boom: Is Your Sales/Engineering Team Equipped to Win? The rush to build enterprise clouds and data centers is an explosive megatrend — and a golden opportunity for solution providers to make money as enterprise IT chases this powerful new paradigm. Senior Design Experts are overloaded and don‘t have a means to safely delegate work to less-qualified engineers. As a result, these providers lose business they should win. Their designs generally: take too long to complete and quote; lack sufficient accuracy, detail, and options; and can‘t be changed on-the-fly to meet the customer’s price point or last minute requirements. Happily, there is a path forward. The answer is for solution providers to equip themselves with a collaborative solution design platform, a proven way to speed up and synchronize the work of salespeople, engineers, and senior design experts. So what should you be looking for in such a platform? Well, getting answers to that question is precisely the goal of a white paper I have authored entitled: The Data Center and Cloud Infrastructure Boom: Is Your Sales/Engineering Team Equipped to Win its Share of the Business? This 11-page paper, sponsored by Netformx, paints a picture of what an ideal platform looks like. Armed with that information, you should be better prepared to assess whether a particular platform is right for your team. After getting multiple briefings and talking to two solution providers using these platforms, I narrowed down the key capabilities of an ideal platform to eight (8) key capabilities. And so, the paper basically walks you through those capabilities, explaining the sales/engineering problems that each is intended to solve. The paper is a useful guide for solution providers contemplating such an investment. Download the paper directly from the Netformx website.